The CFC ClearFire Boiler from Cleaver-Brooks can achieve operating efficiencies of 99 percent in full-condensing mode. This modular hot water boiler is single pass-down fired with stainless steel construction. The boilder produces noise emissions of less than 70dBA, and comes in sizes ranging from 750 MBtuh to 1,800 MBtuh. Utilizing a premix burner with a metal fiber head, the CFC model provides NOx emissions of less than 10 ppm. 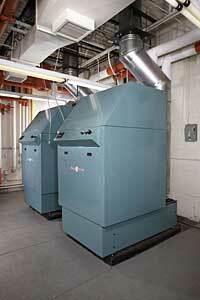 The series of boilers has the ability to run on either natural gas or propane. There are also no minimum flow or water temperature requirements.